While we love thrilling tastebuds, at Lulu’s ice cream, we have more to offer than an innovative way to make ice cream. Nothing is more important to us than friends and family. Our customers and partners are our friends, and together we’re one big family community. We work with a whole bunch of partners to help us make ice cream the Lulu’s way. By supporting local businesses and buying direct whenever we can, we get higher quality ingredients because we know and have a personal relationship with the people we’re buying from and help create lasting positive impact inour community. Here in South Florida, our subtropical climate enables farmers to grow many tropical varieties of fruits, vegetables herbs and edible flowers quite successfully. One of the local farms we purchase ingredients from is Bee Heaven. In keeping with our commitment to future generations, Bee Heaven Farm adheres to strict organic practices and use sustainable agriculture methods whenever possible. The farm is popular in Miami for their Community-Supported Agriculture (CSA) farm membership program and Farmers Market stands. The idea of subscription agriculture was born in Japan over 50 years ago, when people there became increasingly concerned about the growing amount of imported food and the decline of local farming. Known in Japanese as “teikei” (meaning “putting the farmer’s face on food”) the concept took hold in the United States during the mid-1980’s as ‘Community Supported Agriculture’. As a subscriber of a Community Supported Agriculture farm, you can help support local small farms, boost the local economy, as well as provide your family with healthful, fresh produce. Sign up for Bee Heaven’s CSA program and you can pick up your local, organic fruits and veggies at Lulu’s on Saturdays. To learn more about Bee Heaven Farm or their CSA program visit their website, beeheavenfarm.com. Dakin Dairy Farm in Myakka City, Florida sources us with all of the cream and milk that we use to make our ice cream base. 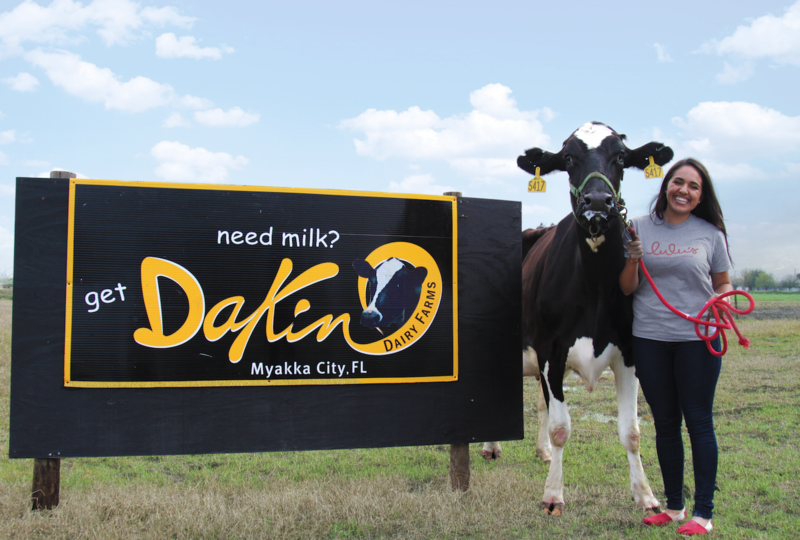 Dakin is a multigenerational Florida dairy farming family, that produces superior quality, wholesome, farm fresh dairy products from healthy cows. They’re committed to using environmentally sustainable practices and state-of-the- art methods. They also value promoting the education of the public about dairy farming and the nutritional benefits of “natures perfect food” – MILK. The Dakin family has been milking cows since 1973 and own three farms in central Florida. A diet of fresh grass, grains, and minerals results in happy, healthy cows that produce sweet, white milk. Cameron, Farren and Jerry Dakin own the three remaining dairy farms in the County, and are amongst the fewer than 150 dairies remaining in Florida. In early 2015, Lulu’s proudly adopted one of the dairy cows at Dakin Dairy Farm, aptly named Lulu. You can learn more about Lulu and her herd at dakindairyfarms.com. All of the treated upcycled pallet wood cafe tables, bar paneling, restroom furniture, and the mint wall garden in the shop were designed and built by local woodsmith Scotty Wonders. Scotty Wonders Wood Co. specializes in designing and constructing hand-built wood furniture, wall art and creative space concepts. All products envisioned are built using local and reclaimed woods as well as other salvaged materials. Each piece and project is a creation that expresses the work’s true historical character. This is something that takes patience, compassion, and much consideration, not to mention a beloved trailer truck. Scott Hendler is very passionate about his work and proud to evolve the tradition of American wood artistry.